It’s been a busy few weeks blogging here at Taylor King Law. We hope you’ve been following along – there’s a lot to learn! This past month we covered the action steps to take immediately following a car accident in Arkansas. Car Wreck 101: What To Do After an Accident starts at the beginning: the first moments after your car wreck or collision. In those moments, your driver’s education class probably seems like a distant memory. What’s the absolute first thing to do after an accident? Should you call the police or attempt to handle things yourself? What about your car – is it safe to move it to the side of the road? Where can you turn for help if you’ve been injured? Of course, that question is easy for us to answer: if you need help, Taylor King and his team of attorneys and staff will be on your side, by your side through the entire process. The other questions are a bit more complex, so you’ll want to visit Car Wreck 101 to learn more. Once the dust has settled and you’re getting ready to leave the accident scene, your next big concern will be medical care. Should you go to the emergency room? Can you wait to see your primary care physician the following week? What are the signs of a serious accident-induced injury? If these are questions you’d like to have answered, you’ll find a great source of information in Car Wreck 102: Medical Care After a Car Wreck. This article focuses exclusively on the medical concerns and questions asked by real Arkansas injury victims. We hope this will help you start the conversation with your medical provider if you’ve been injured in a car wreck. Speaking of accident victims, we’ve learned a thing or two from our clients in the nearly three decades we’ve been helping Arkansans. Their wisdom, along with a bit of our own, has been compiled in the month’s third installment, Car Wreck 103: What Not to Do After an Accident. Take a look at the “infamous five” on our DON’T list. You may even want to follow Bradi Bear’s example and take a few notes; if ever you find yourself involved in a car accident, these are the mistakes you’ll want to avoid! In an instant, a car wreck can change your world. If you are dealing with injuries, medical bills, property damage, or difficult insurance adjusters, Taylor King Law can help. With more than 20 years of experience representing Arkansas accident victims, Taylor King has the experience and skill to help you get the compensation you deserve. 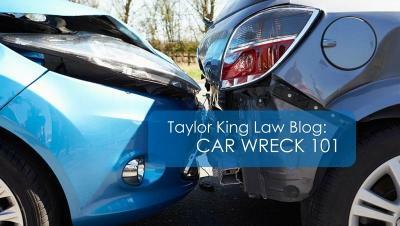 Contact us for a Free Consultation at 1-800-CAR WRECK (227-9732), or fill out our quick and easy Case Evaluation Form online at www.taylorkinglaw.com. You can also download our free Taylor King Law app for iOS and Android. We’ll be happy to speak with you about your injuries and discuss your legal options.